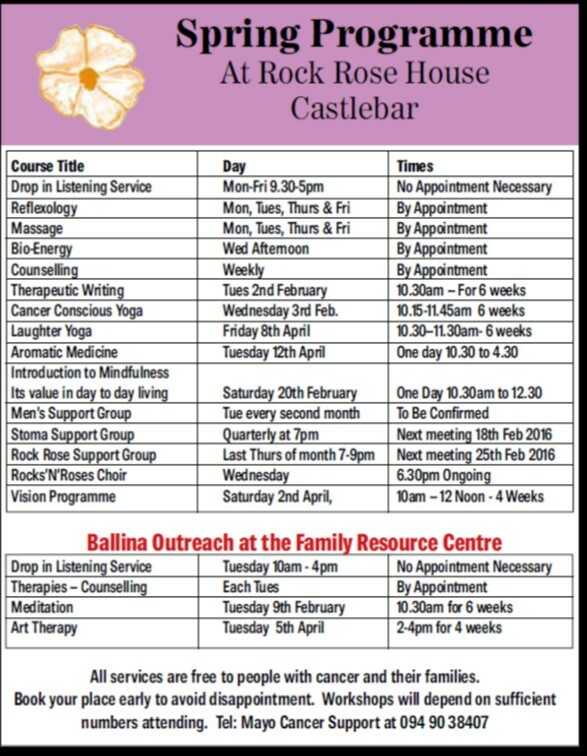 Spring Programme at Rock Rose House and the Family Resource Centre Ballina. Our Spring Programme of services and workshops are now available at Rock Rose House, Castlebar and at our outreach service in the Family Resource Centre, Ballina. To book please call 094 9038407, or drop in to Rock Rose House at any time for a cup of tea and a chat. We are open from 10am – 5pm Monday to Friday. As you can see the Therapeutic Writing begins on Tuesday 2nd February and Cancer Conscious Yoga on Wednesday 3rd February.